Disney Art is a monthly arts and craft magazine aimed at children aged 3-9, each issue focuses on a different Disney brand. Buy a single copy or subscription to Disney Art magazine. 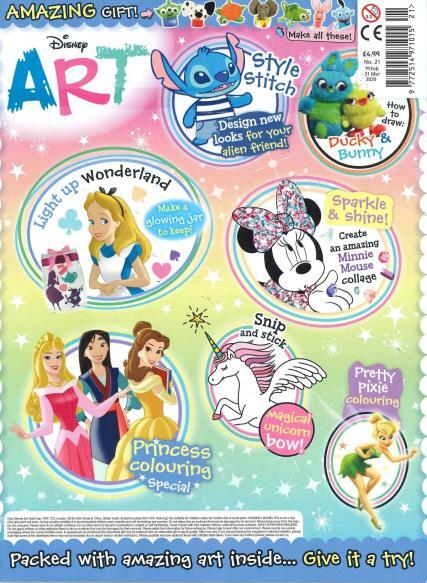 Disney Art is packed full of amazing arts and crafts ideas, and cover mounted with materials such as scissors, colourful paint, stickers and more. Cut out the pages to complete the huge range of craft activities, readers can colour and customise each issue specifically to them. Each issue comes with an art themed gift and a collection of stickers to use alongside the magazine, enabling readers to show off their creative skills.